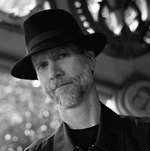 Called “one of the most original musical thinkers of the new century” (Alex Ross, The New Yorker), John Luther Adams is a composer whose life and work are deeply rooted in the natural world. A recipient of the Heinz Award for his contributions to raising environmental awareness, Adams has also been honored with the Nemmers Prize from Northwestern University “for melding the physical and musical worlds into a unique artistic vision that transcends stylistic boundaries.” His orchestral work Become Ocean was awarded the 2014 Pulitzer Prize for Music. JLA’s music is heard regularly all over the world. The Chicago Symphony, the Radio Netherlands Philharmonic, and the Melbourne Symphony have performed his Dark Waves for large orchestra and electronic sounds. Inuksuit for up to ninety-nine percussionists has been performed in New York City’s Morningside Park and at the Park Avenue Armory, as well as many other outdoor venues throughout the U.S., Canada, and Australia. Adams is the author of Winter Music (2004), a collection of essays, journal entries and reflections on his life and work in Alaska. The subject of his second book is The Place Where You Go to Listen (2009) his installation at the Museum of the North that translates geophysical data streams into an ever-changing environment of sound and light. The Farthest Place (2012), a book-length critical study of JLA’s music, includes essays by Kyle Gann, Steven Schick, Glenn Kotche, and many other prominent musicians and scholars.